As breaches fill the headlines, more organizations are adopting a Zero Trust security model and its key principle of "never trust, always verify." Modern implementations of this model are focusing on "Next Gen Access," where identity and authentication can greatly enhance your security posture with less complexity than network-based solutions. Join Nick Fisher of Okta where we’ll discuss how companies today are having success taking a Zero Trust approach to security. Migrating to Office 365 means housing your email and documents in the cloud. While this brings the huge benefits of not having to manage your own server infrastructure, it also brings on new challenges of needing to protect access to your corporate resources from any entry point. Enterprises are saddled with an IT architecture that has evolved organically over time. Mergers, acquisitions, changing priorities, new applications, services and platforms create a huge flux in IT infrastructure. With the adoption of cloud and a drive to a more distributed workforce, IT is tasked with securely managing more users, on more devices, in more locations, and accessing more applications. The demands on IT are compounding quickly. And, limited staffing and budgets mean IT is constantly being asked to do more with less. Major IT modernization initiatives are critical to business success, but each has its challenges. 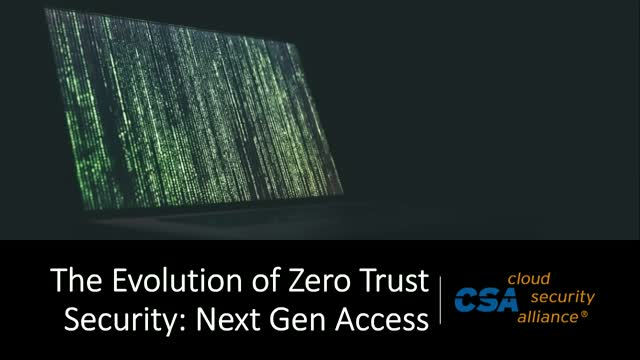 Zero-Trust is quickly becoming the dominant security model for the cloud, shifting the perimeter from the network to the people and devices that make up a modern workforce. As a model with many moving parts, the immediate question is where to start? In the last few years, APIs have become fundamental to our teams, partners, and customers. While we’d like to believe it all happened as a carefully executed plan, much of it came about by a combination of foresight, luck, and success breeding success. Unfortunately, that’s not good enough anymore. Gartner predicts that by 2022, API abuses will be the most-frequent attack vector resulting in data breaches for enterprise applications. In this on-demand, we’ll reconsider our earliest assumptions and use the new understanding to bring our APIs out of the shadows and create an effective API security strategy to protect ourselves, our partners, and our customers. It’s no secret that today’s employees are more mobile than ever, accessing your corporate resources from a myriad of devices, locations and networks. This has brought on a new shift in the IT paradigm which requires identity to act as the central control point in defining an enterprise security strategy. A dynamic identity and access management platform should be extensible and integrate with your existing detection and response tools, as well as give you flexible automation and orchestration in managing an end user’s lifecycle journey. It’s no secret that today’s hackers are smarter than ever before - a motivated hacker can use a variety of different methods to steal passwords from unsuspecting users. While two-factor authentication solutions have been around for a while, they're no longer comprehensive enough to defend the new perimeter. Join us to learn the anatomy of common identity attacks, and how to keep hackers out of your organization. Bio: Teju is a Product Marketing Manager on Okta's product team, focusing on integrations across Okta's set of core products. She is responsible for driving the value of the integrations across not just Okta's products, but also integrations with the vendors that Okta partners with. Prior to Okta, Teju was a field engineer at Microsoft, focusing on getting customers setup with enterprise mobility deployments. Data breaches can happen to any organization, so it's important to understand your organization's risk of a data breach. But where should you start your assessment? What practical and pragmatic steps can you take? Sami is a security professional with over 15 years of experience across the security spectrum helping large enterprises with card fraud, web-scale user authentication and risk management and cloud workload security. At Okta Sami is responsible for technical marketing of Okta security business. Previously Sami was Principal Technologist at CloudPassage and before that he ran RSA’s Americas Sales Engineering for their Fraud Prevention product lines. With the demise of the traditional enterprise network security perimeter, enterprises are leveraging the power of identity to secure and control access to all applications, systems, and data. All this IT infrastructure is housed both on-premises and in the cloud, and must be accessed by authorized local and remote employees as well as a growing web of partners, contractors, and suppliers. Join us to learn how the Okta Identity Cloud coupled with SailPoint Identity Governance can help you securely and effectively authenticate, provision, and govern access to all applications and data across the hybrid cloud and on-premises enterprise. Over their 100-year history, Nexteer Automotive welcomed technology advancements and innovations. They continue this journey in the era of digital transformation to fuel productivity, efficiency and innovation. While modernizing IT led to automation and productivity gains it also significantly increased their attack surface in a time when cyber threats are all too common. The complexity of legacy infrastructure, on-prem apps, and adoption of cloud apps, produced a multitude of end-user entry points. This complicated both security and user lifecycle management. - Reduce reliance on servers and complex architecture requirements of AD FS and MIM while deploying O365 with Azure AD. - Improve user lifecycle management by provisioning employees into all on-prem and cloud apps using HR-as-a-Master. - Integrate identity with network security infrastructure to reduce breaches and gain immediate visibility to when and where threats take place. Don’t want to miss this opportunity to hear how Nexteer used identity architecture to connect everything and improve ease of use, scalability, automation and productivity. Arun Desouza is Chief Information Security & Privacy Officer at Nexteer Automotive Corporation. Previously, he served as CISO and Director, Strategic Planning and Information Security at Inergy Automotive Systems. Arun’s expertise includes security strategy, risk management, identity management, cloud and privacy. Sibrina Subedar is a Director of Product Marketing at Okta. She spent 12 years at Cisco in many roles including Customer Advocacy & Product Management and working across many technologies like routing, switching, security, VoIP. The following 3 years at NetApp she started with product management on security products. As organizations move to the cloud and adopt productivity suites like Microsoft Office 365, they’re presented with new risks around user access and authentication, data security, and cloud threats. - How Okta and Netskope provide additional security controls for your cloud deployments. - Hear about top use cases around identity management and cloud security. #BeforeOkta, Jim went to extreme lengths to keep up with IT requests. #BeforeOkta, Jess’ app got hacked. Twice. The White House’s American Technology Council and Office of American Innovation on modernizing federal technology published specific recommendations to jumpstart a new wave of modernization efforts by accelerating cloud adoption, consolidating networks and prioritizing key applications for needed upgrades. You will also learn about Identity, the hidden accelerator to IT modernization, and how by creating a single solution for identity, agencies can speed up digital and cloud programs. If you’re a government IT leader, you’re no doubt looking at how to help your agency transition from legacy systems, paper-based processes and inefficient use of employee time – all with an eye toward better serving citizens. An innovative cloud-based approach to identity management accelerates these digital transformation efforts, while saving money and strengthening security. While APIs created new ways to reach our customers, our development practices haven’t adapted accordingly. The principles which have served us well are insufficient when users can and will connect at any time from any location with any device while still demanding a smooth, consistent experience. Instead of hoping for the best or blindly applying the old processes, let’s go back to basics and the well-supported standards to build an experience that keeps our customers happy and still lets our team sleep at night. In this session, we’ll cover the foundations of developing, securing, and managing access to the critical APIs that drive our business. If your organization is in the middle of IT modernization, you know how frustrating it can be when legacy systems and modern cloud technologies and applications don’t get along. Choosing the right cloud Identity and access management architecture over a half baked “free” or “included” product can make a difference between a successful transition or another IT horror story. Join Pitney Bowes, Okta, and F5 as we discuss how Pitney Bowes implemented Identity Management and Access Controls to help deliver a secure digitally connected commerce platform for its customers and business partners. With Okta and F5, Pitney Bowes extended their IT infrastructure to securely manage customer access to applications both in the cloud and behind the firewall. Consumers today are demanding rich experiences on their own terms, on their own schedules, just in time, and on mobile. Medical appointments can be scheduled with a few taps for later in the day, photos can be uploaded from your iPhone and printed at your local pharmacy, and last minute hotel rooms can be booked for a bargain with the swipe of a thumb. As companies race to build these omnichannel experiences, identity management challenges such as fragmented user experiences, incomplete user profile and activity information, and security at risk can slow down development efforts.